I wasn’t able to really tell how awesome or not awesome the prop is. 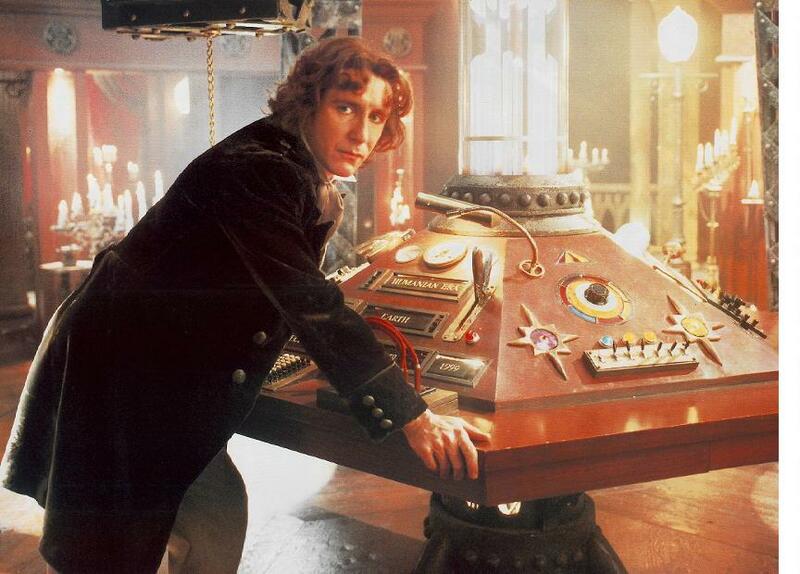 As a Tenth Doctor die-hard, I haven’t spent much time with Matt Smith’s sonic. Even though I could kind of describe it to someone who didn’t know anything about it, I simply didn’t have the knowledge to do a real examination of it and decide just how screen accurate it was or wasn’t. But I do know someone who could absolutely help with that! I sat down with my friend Brian Uiga, Sr. Mechanical Design Engineer at Lasergraphics Inc., life-long Whovian, sonic screwdriver enthusiast, and friend to both Nick Robatto and the guys who run The Wand Company. 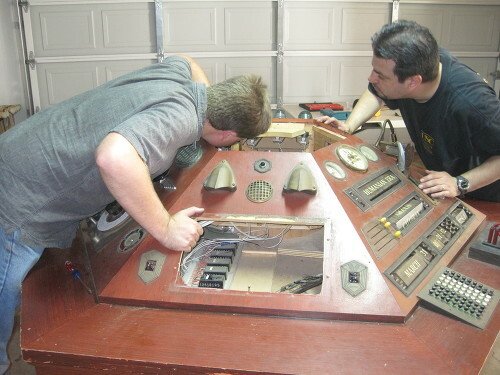 He’s also the production designer for Inspector Spacetime, built a ray gun for the BBC to do a photoshoot for Doctor Who Legacy mobile game, and restored the screen used 8th Doctor TARDIS Console with the owner. 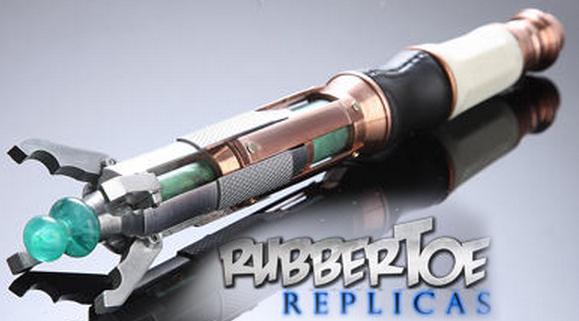 Rubbertoe Replicas is a company owned and run by Nick Robatto, the man “responsible for personally making on screen versions of every sonic screwdriver that has been featured on the show since its re-launch in 2004” according to his website. He has been licensed by the BBC to replicate the 11th Doctor sonic screwdriver as seen on the show – and he is currently embroiled in a limited run of 250 of these screen accurate sonic screwdrivers, which he personally constructs by hand. Let’s take a look at it. The emitter and core of the sonic are made of resin which has been specially cast to give it a marbled effect (this is achieved by waiting for the resin to mostly cure, then eyedropping several drops of light pigment on top and manually swirling it around in the mold with a toothpick). The core then has a hole drilled through the center to allow for wiring that connects to an LED in the emitter. The claws are aluminum, machined on a water jet cutter, and are individually spring-loaded. The aluminum parts of the cage (with the knurling) are machine CNC‘d (the originals were hand-tooled, but for ease in the building of 250 of them, this has changed) along with the copper cage pieces, which are riveted together by hand with brass rivets. The copper pieces connecting the cage to the grip have now been internally redesigned to accommodate a screw thread construction, even though cosmetically it still looks as it did in Matt Smith’s era. The grip is made of Napa leather that has been stretched and heat-shrunk over a conical internal core probably made of either die-cast or 3D-printed plastic after being hand-stitched shut. A microswitch sits on the other side of the grip and controls the LED in the emitter. Sound is added in post-production, and no screen used version of the sonic is fitted with any sound design (although Robatto will add sound to a Rubbertoe sonic when requested for an extra cost). The handle is cast in resin from a mold taken of the original handle, which was hand-tooled by Robatto; it is ivory colored and yellows a bit over time. The original sonic had a cap on the back that housed the activation button (as on the toy version), but after finding that most of these carefully constructed caps had been super glued shut by the props team (and Matt Smith rarely held the sonic CSI maglite style, as was originally intended), Robatto redesigned the cap to be part of the now completely static back piece, which is CNC’d on a metal lathe along with the cage and secured with a set screw (or grub screw if you’re from the UK) located in the handle. EDIT: A wonderful video has surfaced of Robatto showing off the brand new Mk I before bringing it to set for the first time, and you can see every inch of the very first incarnation in great detail, including the back cap, the look of the brand new copper, and what it looks like when fully extended. This impressively-engineered prop was designed from a concept drawing by Dan Walker and built in 9 days. 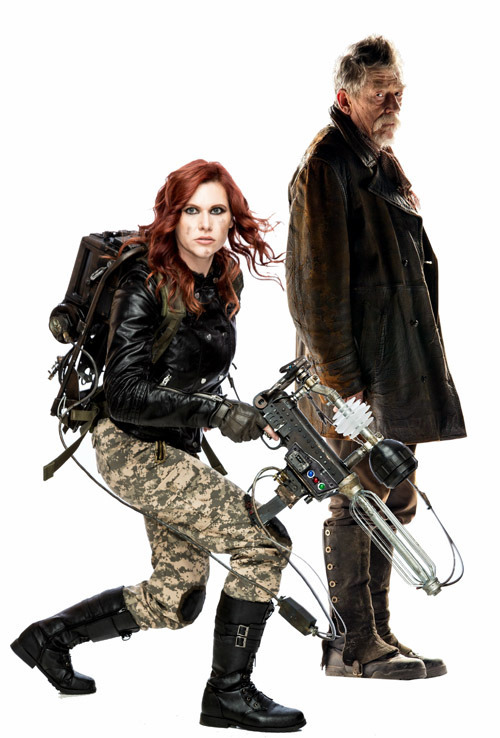 The Mk I was given to Matt Smith on his first day of filming (The Time of Angels was the first episode filmed for S5), where he promptly broke it, as it was designed to be gently pushed open with a thumb – Smith pulled on the cage and accidentally yanked the whole thing apart. It has since been redesigned to be aggressively flicked open West Side Story-style, as Smith decided he wanted to do with it, and is now a much sturdier prop than before. It measures 8⅝” long when closed and 9½” long open, and weighs about 9.4 ounces (9.8-10 ounces with the sound module). Through Rubbertoe Replicas, hand-constructed by Nick Robatto exactly as it’s made for S8, this prop can be purchased for £659.95 (about $1030), and for another £140 (about $219) you can get one with the sound module installed. So, given everything we know about the screen used prop, how exactly does the Wand Company version stack up? Let’s hit the elephant in the room first and then we can get into the nitty-gritty of things: This prop was never meant to be a 100% screen accurate option. It was meant to be as awesome as possible for as cheap as possible to get it firmly into the mid-range for collectors and cosplayers. And to that end, I think this sonic succeeds beautifully. The Wand Company’s sonic cosmetically differs from the SA version in really only a handful of little ways: The claws are slightly longer, the whole thing is slightly fatter and taller, the core is brighter, the grip is rubberized instead of leather (and the button is part of the rubber instead of a secondary microswitch), some of the angles of the machined copper are different and there are some minor proportional differences. Also, the Wand Company sonic is copper plated instead of being solid copper, so it reflects and wears slightly differently than the real sonic, which requires constant polishing and care. 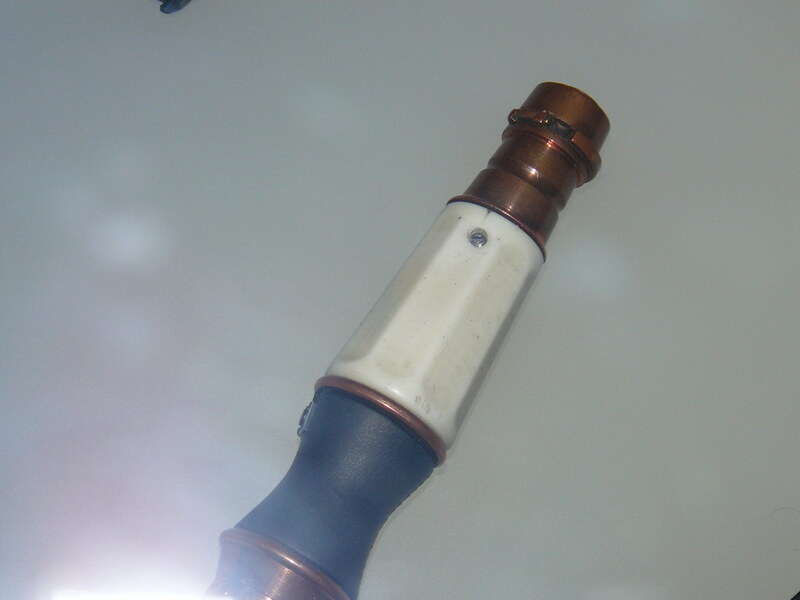 On the Twelfth Doctor sonic, the emitter is the same clear plastic as on the toy, but the Eleventh Doctor Wand Company replica has a murky seafoam colored emitter (see left) that is actually closer to the real marbleized resin. While the above list is cosmetic differences sounds extensive, these are all minor issues and, as you can see above, you really need to put the two pieces next to each other to determine those differences. Take another look at that photo above – just how different do they really look? And let’s talk about what they have to work with. The difference between the Robatto sonic and the Wand Company sonic is the difference between low volume production and high volume production. The Wand Company is also working to create an affordable prop – obviously it couldn’t be handmade from copper and Napa leather and custom-swirled resin. Every non-plastic piece on the Wand Company sonic has been die-cast in pot metal. The copper parts are then plated and all the metal is sealed. 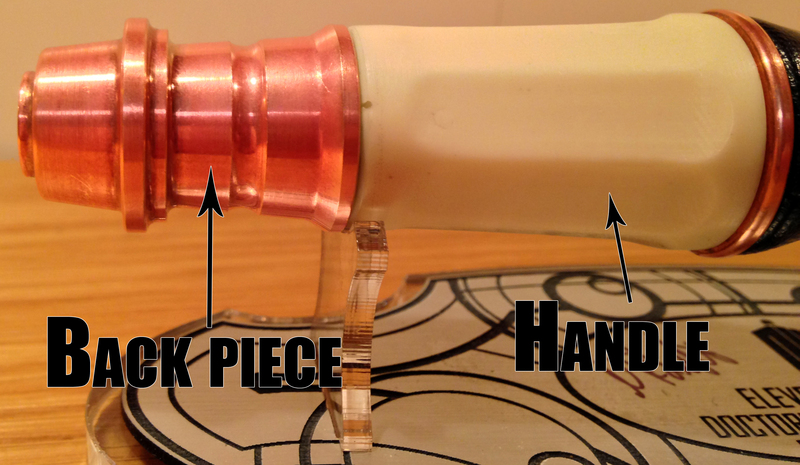 Though the emitter on the Twelfth Doctor sonic is a clear plastic like on the toy version, the core is a specially cast marbleized plastic made similar to how executive pens are made. Essentially, a molten green plastic and a cooler white plastic are added to a mold and swirled around by a machine while the plastic cures. Once it’s completely cooled, the effect pictured at left is the result. This is obviously easier, faster, and cheaper than swirling each part by hand with a toothpick and an eyedropper filled with pigment. Along with the core, the rest of the inner mechanisms are plastic-based, which allows for more stability in the flick-open action of the sonic. Unfortunately, the flicking noise it makes (which, to be fair, is a very satisfying clunk) sounds much closer to the toy’s flick-open noise instead of the Rubbertoe flick-open noise, which has that lovely metallic click that you hear foleyed into the show. Also worth noting is that the Rubbertoe sonic clicks and clinks as you move it, exactly as you hear on the show, which you don’t get as much of from the plastic internals of the Wand Company versions. The grip is a rubberized plastic like you would find in the interior of a car. The button is large but relatively hidden in the grip, unlike the microswitch of the Robatto sonic. Being rubberized plastic, there’s no need for stitching, though they have added faux-stitching into a molded seam in the back of the grip, which is a cute touch. The copper section connecting the cage and the grip has almost no shape to it on the Wand Company sonic – this is partially to accommodate the fact that this unscrews so that batteries may be installed and replaced to make the electronics work. Also worth noting, the faux-rivets on the cage have also been copper plated and left as-is, so that the contrasting brass look of the real rivets is missing from the Wand Company version. The handle on the Wand Company sonic is decently shaped and cast in plastic. The biggest issue with the handle is that it does not include the set screw of the real one, or even something representing the set screw. 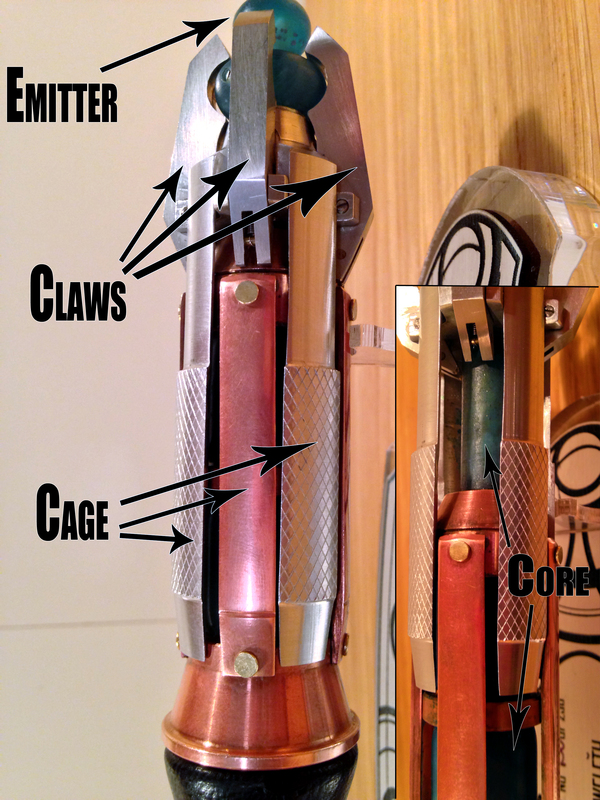 The handle is also one of the biggest changes between the two Wand Company options (flicking abilities notwithstanding): The handle on the Eleventh Doctor sonic is bone white, while the handle on the Twelfth Doctor sonic looks properly yellowed and includes brown flecking, mimicking the look of the original, hand-tooled handle of the Mk I prop currently on display at the Doctor Who Experience, which was likely originally done on accident by use of dirty tools in Robatto’s rush to design and build the prop in a single week. Another cute detail on the Wand Company sonic – each Comic-Con exclusive has the production number lightly etched into the handle, and etched so that it will be hidden when held with your thumb on the button. Lastly, the back cap on the Wand Company sonic is generally correct but could use some tweaks in specific dimensions and shapes. It’s possible some of the lack of clarity in the design is a by-product of having it copper-plated instead of machined, but it could still stand some small improvements. The Wand Company sonic weighs 7.2 oz and is 8¾” long when closed and 9⅞” when open, making it only slightly lighter than the Rubbertoe version and slightly bigger (the Wand Company sonic has clearly been based on the toy version, as its size, shape, and relative inaccuracies are almost exclusively shared with the toy). 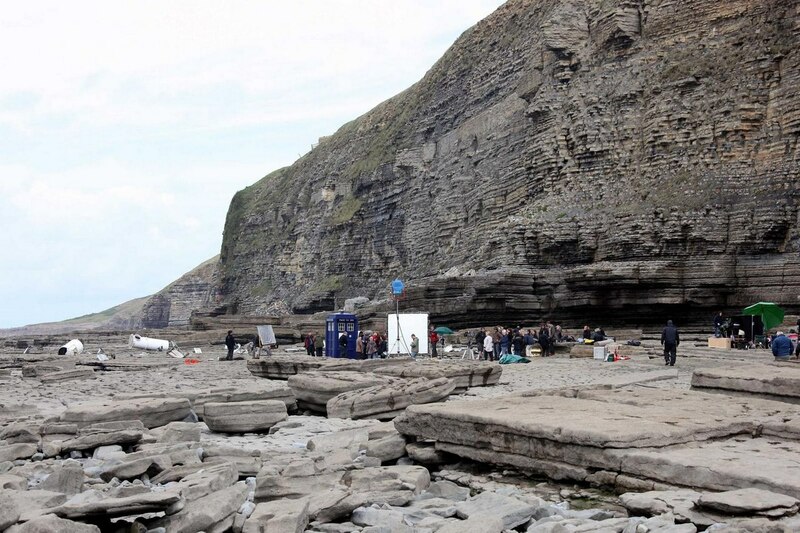 It really has great heft to it and the flick action of the Twelfth Doctor version is fantastic. It was really all I could do for the rest of Comic-Con to not carry it around with every cosplay and flick it open all day. The makers say it’s good for at least 10,000 flicks, which isn’t a whole lot but is enough to get you through a few years at least, provided you display it on occasion. Once for sale, The Wand Company sonic will cost $120, so 10% of the price of a Rubbertoe sonic. I have one major beef with the Wand Company 12 sonic; they knew they were going to redesign their Eleventh Doctor sonic to flick open, which would take some reconstructing of the inner mechanisms. When they designed the Eleventh Doctor version, they had just acquired the license to do this and their only real reference was the toy and whatever the BBC may have supplied, so it would make sense to use the toy as the main reference. 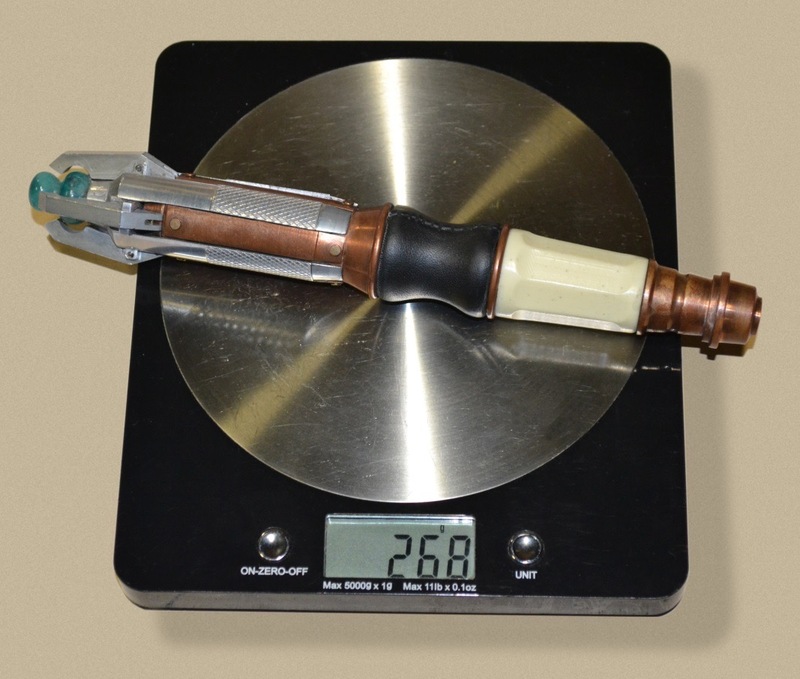 By the time they came around to the idea of redesigning it to flick open properly (there have been many people “converting” the 11th Doctor sonic to flick), they had already done their 10th Doctor sonic, which, in the wonderful tradition of doing it better the next time around, they managed to 3D-scan from David Tennant’s actual prop (which, as I understand it, was a lucky happenstance) – it was not only a fantastic idea, it paid off extremely well and they were applauded for their efforts. So, when they went back to redesign the 11th Doctor sonic… why didn’t they find someone with a Rubbertoe sonic or chat with the guys running the DWE and 3D-scan a Robatto or QMX prop? The best explanation would be the cost, as they don’t intend on selling nearly as many of the 12 sonics as they did the 11 sonic (and therefore would have to break even with far less sales), but it really would have been fantastic to have had it retooled from a 3D-scan of a screen accurate/used prop. It also can’t have been for space reasons – they shoved the same electronics into the Tenth Doctor sonic and it’s way smaller than a Robatto sonic. That would have solved nearly every cosmetic critique detailed above, despite how minor almost all of them are. That said, at this point I’ve only talked about the look and feel of the sonic. This is where the comparison to a screen accurate sonic ends, because the SA sonics aren’t even wired up with sound, and the Wand Company sonics are universal remote controls! The first thing to note is that the Twelfth Doctor sonic is LOUD. It’s easily the loudest sonic screwdriver option available, and can definitely be heard well on a busy con floor. It also has the fantastic knowledge of hindsight, and includes a zillion little hidden features either unique to it (E.G. if left turned on, it will eventually blink its light at you, and after 5 minutes it will beep/flash “S-O-N-I-C—O-K-A-Y” at you in Morse code, which is a cute reminder to turn it off as it takes two AAA batteries to run) or new to the Twelfth Doctor edition. As a gesture-based programmable universal remote, it recognizes up to 39 different flicks, taps, and twists, which can be programmed to run any infrared system you may have set up (like your TV or stereo) – three memory banks allow up to 3 different devices to be remembered in your sonic at any given moment. Along with this, it’s been outfitted with a TV-B-Gone feature that allows you to turn off ANY TV, anywhere, regardless of whether or not it has been programmed into the sonic (though it cannot turn a non-programmed TV back on). Hidden features in the remote allow for it to be locked (so that you can’t use the features without a passcode), a variety of sounds from the Doctor Who universe, more Morse code, and possibly more than I haven’t discovered yet. The functionality of the electronics and universal remote capabilities is, frankly, astounding. If you already own a Wand Company replica, you’re familiar with this already, but it bears repeating: They make a truly fabulous gadget. Overall, I give the Wand Company Twelfth Doctor’s sonic an A-. While the cosmetic differences could have been fixed up by scanning a Rubbertoe prop, the extreme reduction in price for the vast improvement in quality and functionality over the toy or their 11th Doctor version help boost my rating (though, for the casual or very young cosplayer, the toy is still a much better option than the Tenth Doctor toy, which is significantly larger than the screen used prop). It’s a fantastic mid-range option for people like me who want a higher quality prop for cosplay but can’t afford a $1200 flashlight. I really do love my flickable Wand Company sonic (which, as has been pointed out elsewhere, is slightly amusing as their Eleventh Doctor sonic is static and their Twelfth Doctor sonic flicks, even though Matt Smith flicks his sonic all the time and Capaldi all of twice in the entirety of S8), and I highly recommend it to collectors and cosplayers who can save up the scratch to pick one up. 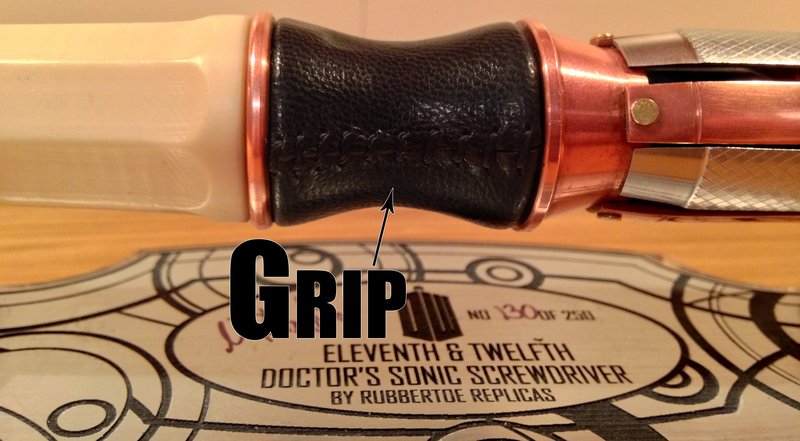 The Extending Twelfth Doctor’s Sonic Screwdriver will be available starting September 7th. 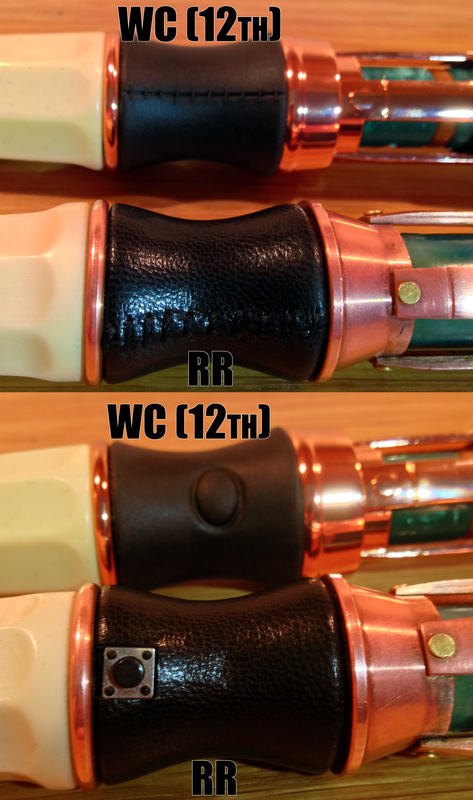 EDIT: For more information on The Wand Company’s 12 sonic, here is a fantastic write up by Wand Company co-owner Chris Barnardo – in it you can see a hero Capaldi prop with precisely the same flecking in the handle as the Wand Company’s 12 sonic! The show was relaunched in 2005, not 2004. Nick Robatto did not make all the sonics since the return of the show. He maintained Tennant’s sonic, but did not build it originally and didn’t have anything to do with the 9th Doctor Sonic, as far as I am aware. The Wand Company Sonic was not based on the CO toy, as a rather cursory look at the two side-by-side will show you. As for the changes necessary to drastically change the appearance of the 12th Doctor version from the 11th Doctor version, it actually is quite prohibitively expensive to retool the manufacturing from scratch, and would almost certainly have resulted in a much more expensive product. 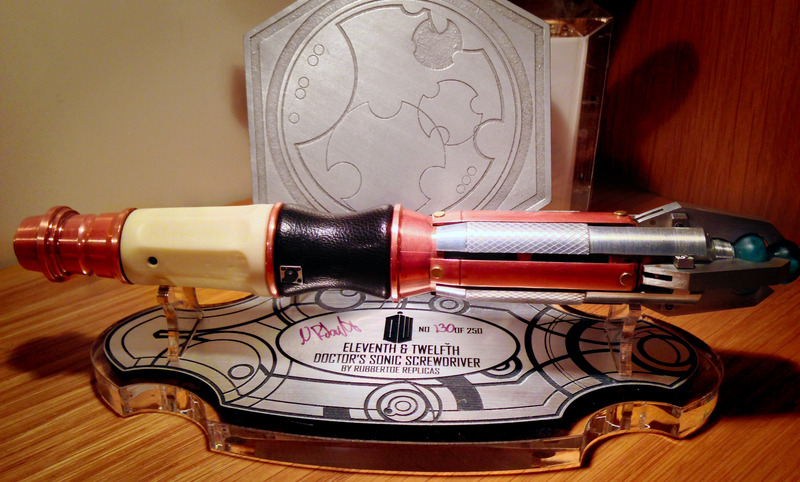 You described the handle on the 12th Doctor TWC Sonic replica as “Bone White.” Well, have another look. I think you’ll find that great care has been taken not only to make it an off-white color, but to incorporate tiny little flakes that simulate where dirt collected in the tiny pits of the porous surface of the original. No, it’s not a perfect replica, but it wasn’t meant to be. I have a $1000+ replica coming to me, but I still LOVE my TWC 12th Sonic (#131), that’s how good it is. Also, tell your friend Brian that his 2nd Doctor sonic isn’t even close. 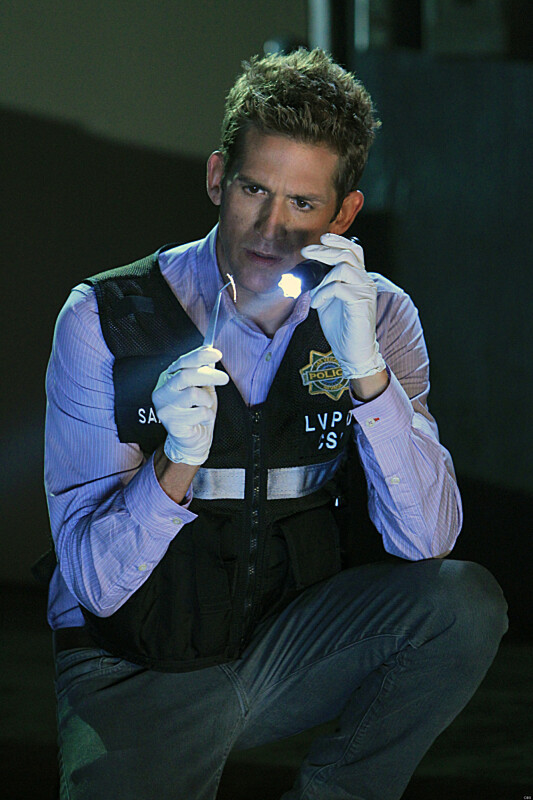 Shawn, my quote about Nick working on the sonics since the relaunch of the show is a direct quote pulled from the Rubbertoe Replica website, which is why it’s both in quotes and italicized. The article has been run past TWC who appear to have used the CO toy at least as a reference, though it’s been clarified that many of the parts were slightly altered. 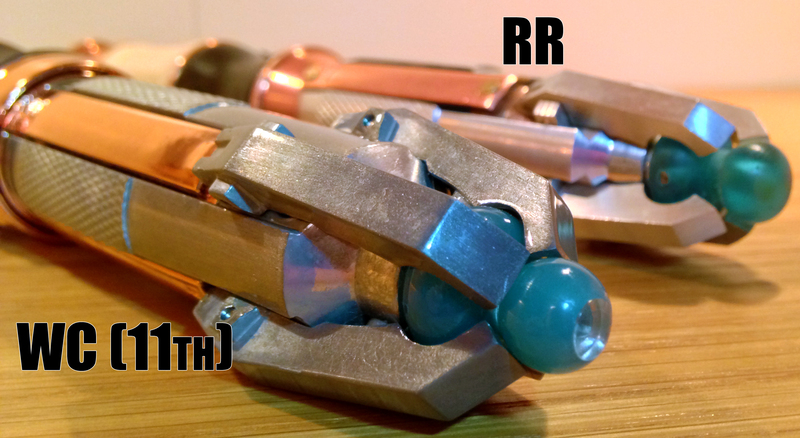 Also, I’m wondering if you actually read my post at all because you’ll notice that not only do I describe the handle on the ELEVENTH Doctor sonic as “bone white,” I also talk about how pleased I am to see the yellowed handle on the 12th Doctor version and talk about the flecking mimicking the Mk I sonic and link to a high res photo of the Mk I in the DWE for reference. I love my 12 TWC sonic as well. And I have no reason to criticize any of my friend’s work for any reason, so I won’t. Also, now that I’m looking at it again, that’s actually a machined aluminum War Doctor sonic, not a 2nd Doctor sonic at all. Alex, apologies on the handle part. It was late and I must have misread. I thought it was comparing the TWC 12 to the RR 12. My bad. For the record, it’s a mostly very informative article with a lot of information that most fans won’t know. So good job. I wasn’t picking on you with the corrections, but my editorial style could use a better bedside manner. 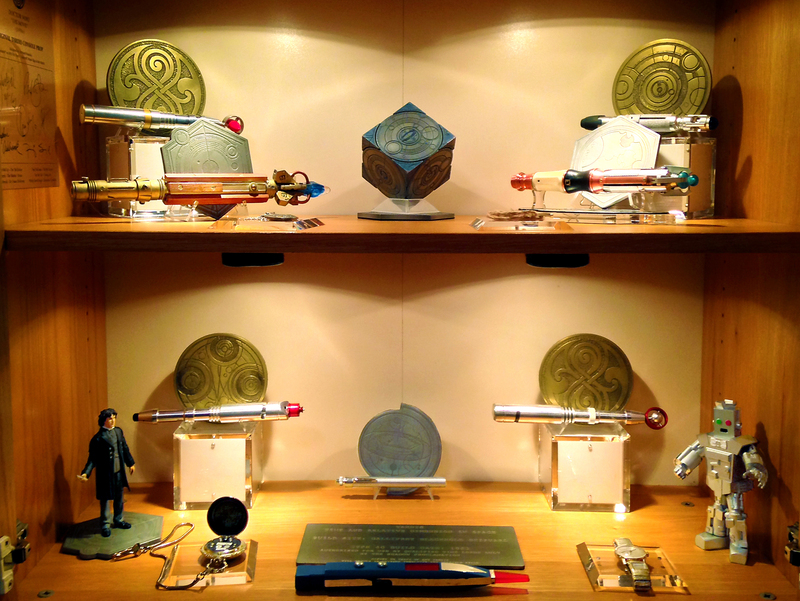 But, I do have to clarify on that 2nd Doctor thing: The sonic I’m talking about is in the middle on the bottom shelf, to the right of the War Doctor. It’s a pen light, but it’s not the right pen light. The correct one is quite distinctive. Your friend probably knows it’s the wrong one, though… as the right one is near impossible to find. You can see that by now Brian has responded explicitly but yes, he also clarified with me that he knows it’s the wrong pen light but he’s busy with some car builds and hasn’t had the time to customize his 2 sonic yet. That’s just his display in his house that he was kind enough to let me photograph so it’s constantly being updated. Nice catch on the pen light – it is indeed the wrong bog-standard pen light, instead of the two different bog-standard pen lights that it looks like were used in Krotons (the strange belt clip one) or War Games (the Eveready one with the teal back end). I have a pile of parts and some custom electronics to make one or other of two ‘correct’ pen lights in a box with the other dozen or so Sonic Screwdriver projects, but I’ve got two custom car builds and the better part of a renovation to finish on my home first before I do any more tinkering on buzzing flashlights…. Hi, Good detailed article and very informative. However, I don’t think that the Wand Company sonic was based on the Character Options toy version, I think it’s more that the CO and the TWC Sonics used the same base reference supplied by the BBC to produce their products, resulting in some of the same inaccuracies. The Wand Company at least used the toy for reference, though they improved where they could for the 11 sonic (with further improvements for the 12 sonic). It’s possible they were given the same reference material but the biggest tell here is the end cap, which are accurate within 15-20 mils to each other. I really liked this review you did. would you happen to have a review like this for the 10th doctors remote from the wand company? Thank you! I’m glad you liked it. I would do a review like this for the 10 sonic as well except that I don’t have access to a screen used sonic to reference for that. Generally I’m a HUGE fan of the 10 sonic, it was 3D scanned from a hero prop so it’s perfectly scaled and the electronic components are top notch. My only issue with it is that it’s not properly crackle painted, which would up the price considerably as it’d have to be hand-painted. Does the motion work well? Also is the sound muted when closed? how’s the the rechargeable battery? Does it last awhile? The motion is excellent, like this one. The sound is a bit muted when closed but fairly loud when open (though not as loud as the 12 sonic). The rechargeable battery is brilliant and I wish it was a feature on this sonic as well. And yes, it lasts quite a while, easily enough to get you through a con provided you’re not using it for hours at a time every day.